How deep can you go when you get off the mat and into the pool? Years ago, when I was doing an intensive workshop with Eric Small on Yoga for MS, he told us that when he was younger and found it difficult to practice yoga on a yoga mat because of his flaring MS symptoms, his then teacher, B.K.S Iyengar, told him to take his asana practice into the pool. What a shame that this insightful “seal of approval” from the master yogi himself is largely unknown. Imagine all the people who at this moment in their life, because of injury or illness, could potentially find yoga accessible if they were to transfer their practice into a pool environment. People with spinal injury, joint issues, arthritis, fibromyalgia, excessive weight, rotator cuff injury, hip replacement, pre/post surgery…… The list is really endless beyond helping those with MS.
Asana or yoga poses as I have been taught by my wonderful teacher Kim Schwartz, is a pranic model, and so the non-yoga aware world needs to be educated in this, because they have an opportunity in finding greater balance in their lives on more than just a physical level. Definitely if the student is in pain, then that can be a huge distraction of the mind and that needs to be addressed first. 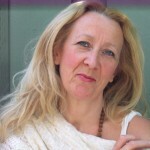 When the student is pain free for the first time, perhaps in year,s as was the case with Rosie, one of my students with fibromyalgia, they will be open to the many other ways that the science of yoga, rather than just yoga asana can help to improve their lives. Check out this video. Gravity has a habit of compressing the spine throughout the day and so it is really important for us to try and become more aware as we function through the physical vehicle, in the same way that we need to be aware when we are driving a car. Mystically speaking, the “party is in the spine”, in terms of where we are concentrating our energies, inward and upward to self awareness, and yet, we need to get to the spine via the major joints of the body. If a student has rotator cuff injury, then range of motion will typically be painful, and it would not be prudent for a student to force extending her arms overhead. Time spent in loading the joints first, such as in wall plank can help the student to experience what is happening to the skeleton and the muscles, as she bears weight in the arm bones, and can experiment with her hand positions. 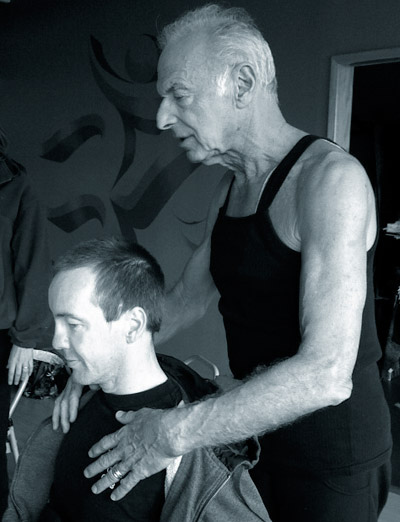 In these photos, for example, a new student can feel experientially more of a bias to the armpits deepening, the rib cage opening, or the shoulders and shoulder blades moving down the back, releasing the neck. After the weight bearing enquiry, she can them move on to exploring her range of motion using the damaged shoulder as a teacher and reference point for the healthier side. At the moment, Aqua Yoga is one of the hottest new yoga trends according to an ABC report recently, and this means that pioneering Camella Nair, who has been teaching her Aqua Kriya Yoga program for over a decade, is busy taking aqua yoga out into the world. Students who may not have thought yoga was accessible for them, as well as the yoga community that has been concentrating their classes to a sticky mat, could do well to become a part of this deeply therapeutic modality. Check out the Aqua Kriya Yoga website for classes in your area, or consider expanding your training and start teaching yoga in the water yourself. Camella Nair, E-RYT & PRYT, was born and raised in Bedford, England. At the age of 17, she began attending yoga classes with her mother. She moved to the United States in 1995, when her firstborn son was only 8 weeks old. It was then that she began to deepen her spiritual practice as she became a mother and housewife. She found the teachings she craved in a formal lineage when she began her studies with the Temple of Kriya Yoga in Chicago. It was a few years after the birth of her second son that she obtained her Yoga Teachers Certification. As her studies deepened, she was formally initiated as a disciple in the Kriya lineage by her guru, Swami Enoch Dasa Giri, and then went on to study and become ordained as a Swami in the Kriya Seminary. The Kriya lineage she has been ordained into has an unbroken line of teachers that impart the mystical teachings of yoga in the oral tradition. Kriya is a conscious, volitional, engaged spiritual action that is based upon self-discipline and self-study. She is one of the few women priests in the Kriya lineage formally teaching. In 2011, she completed the higher seminary level of study. 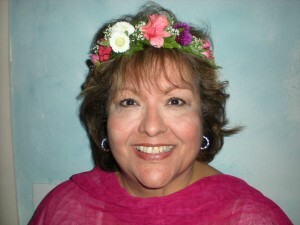 Check out her new book, Aqua Kriya Yoga, or her teacher training program. How wonderful this is! Doing asana in the pool can be so healing. I have to support this healing modality of yoga in the pool. 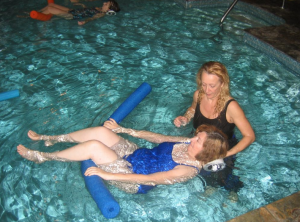 After hip surgery August of 2012, as a yoga teacher I was frustrated to not be able to practice so my therapist told me to get in the Pool and do modified yoga poses as part of my healing…felt wonderful!